Risk is at the heart of all financial transactions. That said; in cases of Mergers and Acquisitions, buyers and sellers of companies can and do have contrasting goals and very different notions of risk in a deal. Sellers often take their company or division to market in order to reduce risk, exchanging an operating unit for cash or securities. In the case of a closely-held business, the owner may hold almost all of his or her wealth in the stock of one company and selling the company is the path to diversifying their personal portfolio. For buyers of companies, the decision of whether to make an offer and at what price is underpinned entirely by risk analysis. Each potential acquirer in a competitive auction process will build financial models to determine the value and structure of their offer. After carefully analyzing the target company’s operations and financial statements, the acquisition team develops a projected cash flow forecast that reflects the new division’s potential under their ownership. The team then determines the current value of those estimated cash flows using a factor called the “discount rate.” After the transaction, there may be some sharing of risk between buyer and seller in the form of deferred payments to the seller (an “earn-out”) or a note held by the seller. Buyers make acquisitions for a number of strategic reasons such as to build economies of scale, remove competitors, or diversify their product and service offerings. One trend that emerged in 2012 was consolidation in the ship repair market. General Dynamics NASSCO acquired two major US Navy ship repair yards in the Norfolk area in anticipation of a strong overhaul and repair market in the coming years. GD NASSCO followed its 2011 purchase of Norfolk’s Metro Machine with the acquisition of nearby, privately-held Earl Industries in the summer of 2012. Together these acquisitions provide GD with greater scale, a strong East Coast presence and a number of new government contracts for the repair of multiple combat and support ship classes. 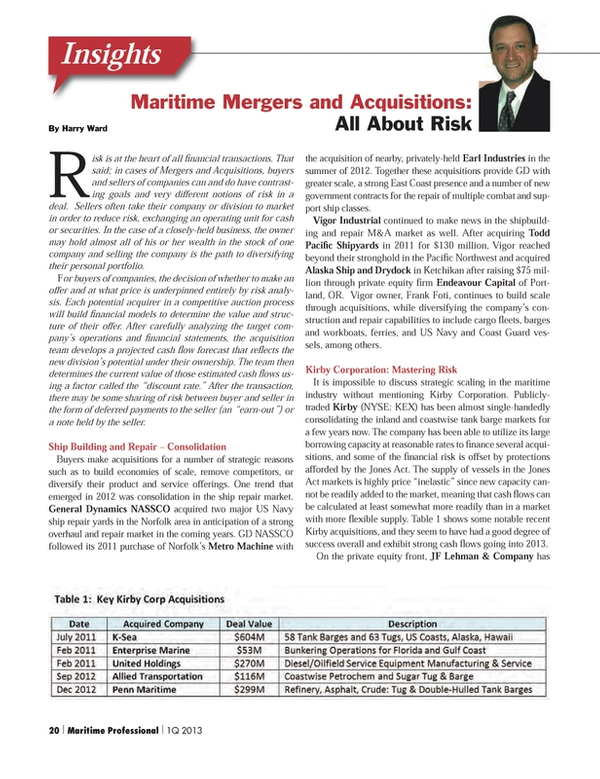 Vigor Industrial continued to make news in the shipbuilding and repair M&A market as well. After acquiring Todd Pacific Shipyards in 2011 for $130 million, Vigor reached beyond their stronghold in the Pacific Northwest and acquired Alaska Ship and Drydock in Ketchikan after raising $75 million through private equity firm Endeavour Capital of Portland, OR. Vigor owner, Frank Foti, continues to build scale through acquisitions, while diversifying the company’s construction and repair capabilities to include cargo fleets, barges and workboats, ferries, and US Navy and Coast Guard vessels, among others. It is impossible to discuss strategic scaling in the maritime industry without mentioning Kirby Corporation. Publicly-traded Kirby (NYSE: KEX) has been almost single-handedly consolidating the inland and coastwise tank barge markets for a few years now. The company has been able to utilize its large borrowing capacity at reasonable rates to finance several acquisitions, and some of the financial risk is offset by protections afforded by the Jones Act. The supply of vessels in the Jones Act markets is highly price “inelastic” since new capacity cannot be readily added to the market, meaning that cash flows can be calculated at least somewhat more readily than in a market with more flexible supply. Table 1 shows some notable recent Kirby acquisitions, and they seem to have had a good degree of success overall and exhibit strong cash flows going into 2013. On the private equity front, JF Lehman & Company has recently been almost as busy as Kirby. Most recently, the investment firm added to its portfolio of maritime services companies by acquiring IMECO, of Iron Mountain Michigan. IMECO provides electro-mechanical solutions for government and commercial customers, and parallels Lehman’s recent investments in marine repair and overhaul companies such as US Joiner, Turnbull and add-on acquisition JCI Metal Products. On the selling side of the equation, the investment group that acquired United Maritime Group from TECO Energy in 2007 spent much of 2012 divesting multiple UMG divisions to a range of different buyers. The group paid down its significant debt load by selling US United Barge LLC to Ingram Barge Company in April for $219.8 million; unloaded US United Bulk Terminal LLC to Bulk Handling USA for $216 million in May; and in October sold US United Ocean Services to International Shipholding Corp (NYSE: ISH). United Maritime focused on serving the domestic and export coal and petroleum coke markets. Bulk rates have been under downward pressure since the acquisition from TECO in 2007, and the investor group successfully divested the units in a very short period of time. The struggles of bulk carriers are reflected in the poor three-year performance of the bulker public stock index (Figure 1). Despite the continued doldrums for much of the marine industry worldwide, a few markets have shown strength in recent years. Emerging opportunities in Australia related to defense, oil & gas and mining have recently driven a string of acquisitions there. Britain’s Serco Group plc (Serco) acquired the remaining 50% of their joint venture DMS Maritime Pty Ltd from their JV partner P&O Maritime Services. DMS, one of Australia’s largest maritime service operators for defense and commercial customers now has a market value of about USD $260 million, and is well-positioned to benefit from emerging requirements of the Australian Defence Force. BMT Group acquired Western Australian marine and coastal environmental protection specialists Oceanica Consulting in November 2012; and Champ Ventures joined with HarbourVest Partners to purchase an 85% stake in Australian shipping company Sea Swift to serve remote mining and construction enterprises in and around Queensland. Finally, Matson Navigation extended its reach into the South Pacific with the acquisition of Reef Shipping in Auckland, New Zealand. Reef serves a number of island nations which are all new markets for Matson. Positive news continues to flow from the US offshore industry as production increases and operators continue to move assets back into the Gulf Coast region from West Africa and Brazil. The offshore stock index remains relatively strong (Figure 1), and M&A activity may therefore pick up in the coming year. Harvey Gulf International Marine acquired relatively new supply vessels from Bee Mar LLC offshore for $243 million in September. Bollinger Shipyards built the PSV’s on spec, and set up Bee Mar as an operating company when they found little market for the vessels. Harvey Gulf has added the Bee Mar boats to their growing fleet of “green” vessels and they currently have two LNG-powered OSV’s under construction at TY Offshore. Risk management is a critical skill in the asset-heavy marine industry, and numerous players are perpetually evaluating their exposure level and modifying their risk exposure. Mergers and Acquisitions are an excellent window into the financial risk landscape of the industry, and we will continue to track M&A activity that has been increasing steadily since the aftermath of the financial crisis.